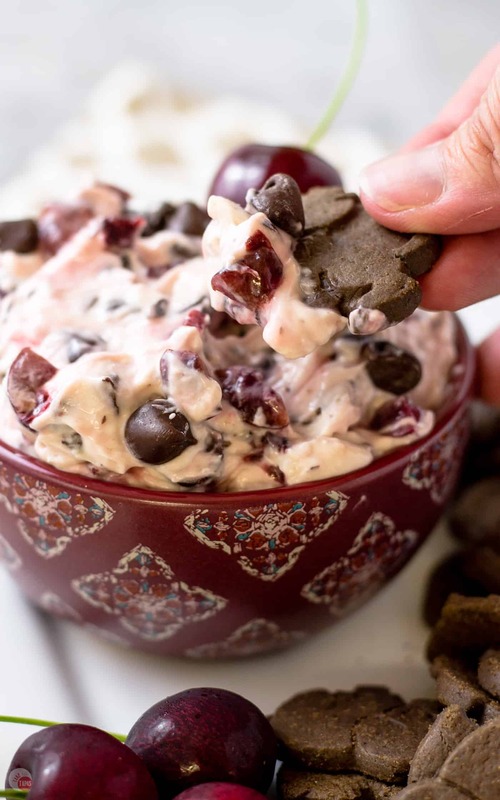 My Drunken Cherry Garcia Dip will have you enjoying your favorite ice cream flavor, ok mine really, full of tart cherries, dark chocolate chips, and a hint of amaretto! All combined in a creamy vanilla cream cheese base and served with chocolate cookies for the perfect dessert or party food. Cherry Garcia is an ice cream flavor put out by Ben and Jerry’s in 1987 as a tribute to the Grateful Dead guitarist Jerry Garcia. The flavor combination was actually created by a fan that posted her recipe idea at one of their local ice cream stores. Trying to replicate the flavors of a cherry cordial, the ice cream giants settled on vanilla ice cream, bing cherries, and chocolate chunks. Today they use cherry ice cream – not sure why because vanilla is great as a base – and still use the bing cherries and small chocolate pieces. So just how do I make Cherry Garcia Dip? 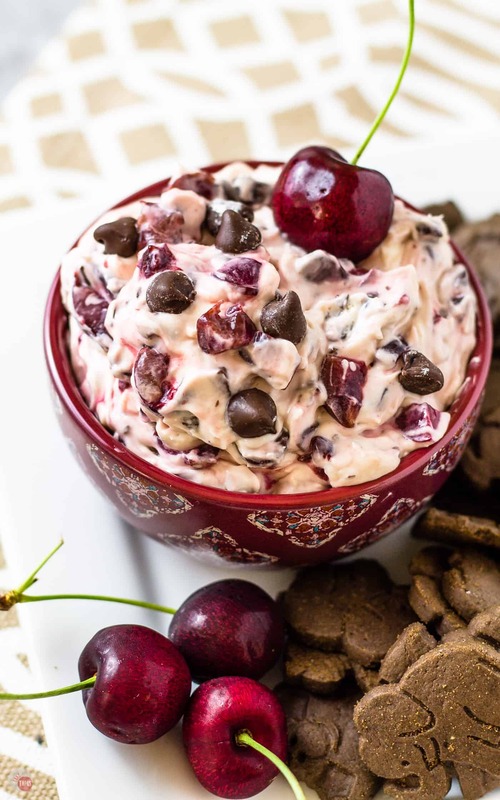 Start with the basics like the ice cream men, cream cheese and vanilla as the dip base, add in some chocolate chips for texture, and stuff it with all the delicious cherries you can handle. Then we adult it up with a dash of amaretto because cherries love amaretto! Just take me to the DRUNKEN CHERRY GARCIA DIP Recipe Already! 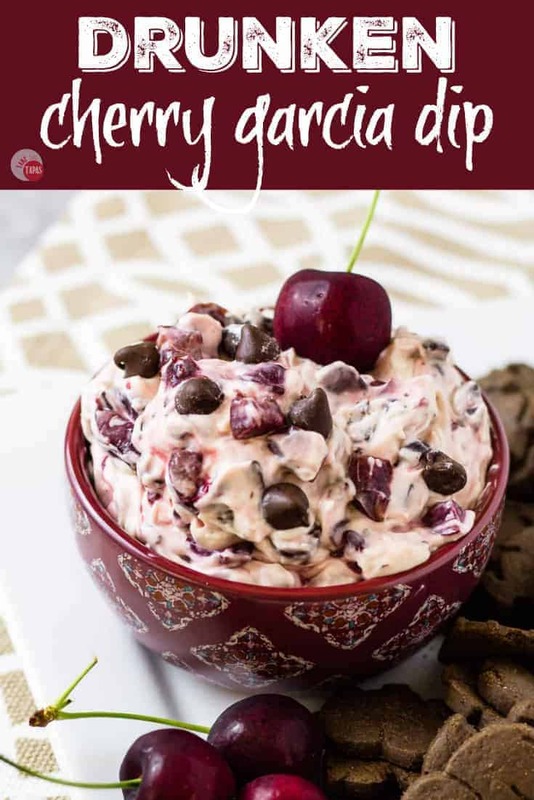 If you’d rather skip my (very helpful, I think) tips and tricks, essential cooking info, and similar recipe ideas – and get straight to this delicious easy AMARETTO CHERRY CHOCOLATE DIP recipe – simply scroll to the bottom of the page where you can find the printable recipe card. What kind of cherries are in Cherry Garcia? Now before we discuss all the different cherries to use and where to get them, I have to tell you about a conversation I overheard in the store, right in front of the ice cream. How fitting! While doing my shopping one week, walking through the store gathering the items on my list, listening to music on my headphones, I overheard an ice cream question. Ok, I was grabbing a pint of ice cream that was not on my list and heard two ladies next to me talking about the different flavors. One woman asked the other what did the flavor Cherry Garcia have in it. The other replied that it was vanilla ice cream with chocolate and marching cherries in it. STOP! You read that right! MARCHING CHERRIES!!! She meant to say maraschino cherries because when the first lady asked what a marching cherry was the second lady told her they are the neon ice cream cherries. What is a Maraschino Cherry and how is it made? A Maraschino Cherry is a preserved cherry, not pickled, but brined and then suspended in food coloring and sugar syrup. Usually made from Royal Ann, Rainier, or Gold kinds of cherries, the brining process lightens the natural color of the fruit and it then takes on the neon color of the sugar syrup enhanced with food coloring. Doesn’t sound fun to me to think about the bright color and extra sweet cherries making a great ice cream topping or addition to cocktails, the ones you drink and fruit cocktail itself. I know that marching cherries have their place in this world, but not in my Drunken Cherry Garcia Dip, that’s for sure! I’m sticking with all natural cherries, for the record! 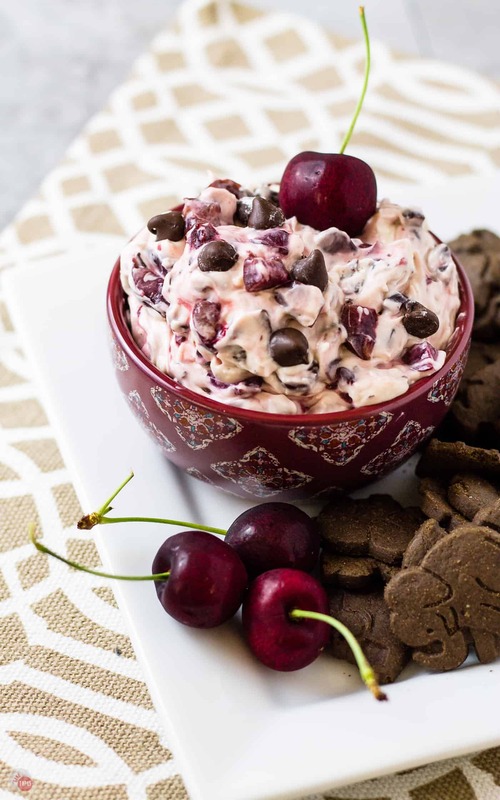 Some other sweet dips that you might like are my Boozy Banana Cream Pie Dip, My Oreo Cheesecake Dip, and for my die-hard cherry lovers, my Cherry Pretzel Salad Dip. Wash the last one down with my Cherry Amaretto Limeade! Check them all out and tell me which one is your fave. What’s the difference between Cherry Garcia and Cherry Cordial? A Cherry Cordial is both a candy and a flavor. In terms of flavors, they are kind of the same thing but cherry cordial flavored ice cream uses maraschino cherries and Cherry Garcia, the ice cream from Ben and Jerry’s, uses sweet dark Bing cherries. A cherry cordial is a candy made by taking a cherry or similar fruit, adding or dipping it in invertase, which is an enzyme that breaks down sugar, and wrapping it in a chocolate coating. The enzyme breaks down the fruit and sugar turning it into a liquid, a process that can take up to a few weeks to complete. Depending on how soon you bite into the cordial after it’s been made, determines the amount of liquid in the center of the candy. All of these descriptions of cherry cordials and Cherry Garcia, doesn’t get us any closer to an actual dip so let’s get back to it. To recreate the beloved ice cream flavor into my Drunken Cherry Garcia Dip, I start with a traditional sweet dip base of cream cheese, powdered sugar, and vanilla extract. I mix in the chocolate chips but this time I use dark chocolate for more of a flavor contrast to the sweet base. To keep the dip cool while serving, I use frozen dark cherries. I love that I can find them year-round and that they are packaged whole but without the pits. Just a rough chop of the frozen cherries and a quick mix in the dip, along with some amaretto, and we are ready to go. I like to serve my Cherry Garcia Serve with chocolate animal crackers to keep the three flavors pure but feel free to serve with whatever you have on hand. That might just be a spoon or a clean index finger! Other Sweet Dip Recipes to try! 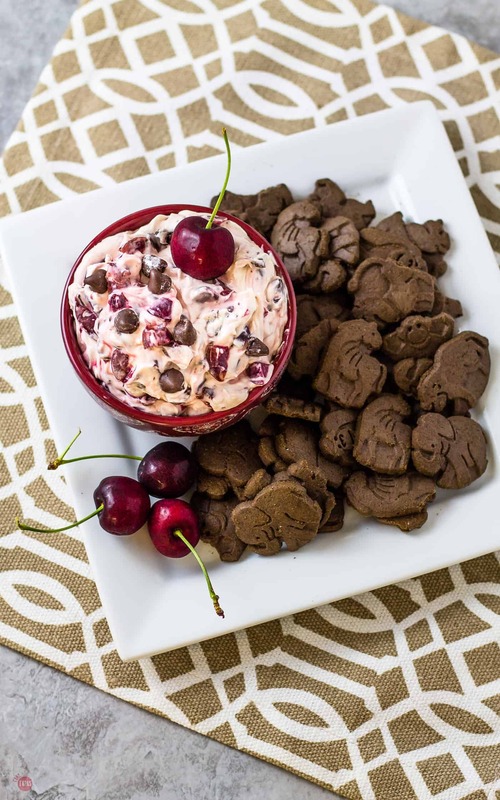 If you love this DRUNKEN CHERRY GARCIA DIP Recipe as much as I do, please write a five-star review in the comment section below (or on Pinterest with the “tried it” button – you can now add pictures into reviews, too! ), and be sure to help me share on facebook! 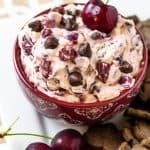 My Drunken Cherry Garcia Dip will have you enjoying your favorite ice cream flavor full of tart cherries, dark chocolate chips, and a hint of amaretto! Dice your cherries (fresh or frozen) into quarters or small bite-sized pieces. In a mixer, place your cream cheese. Add your cherries, dark chocolate chips, and amaretto. Stir by hand until just combined. This will keep your cherries and chocolate chips from breaking up too much. Serve with chocolate cookies or crackers. Thank you for your suggestions! It does taste wonderful. I didn’t see on the recipe when you are supposed to add the whipped topping. Thanks! So sorry, I fixed it! Thank you for pointing it out. You fold the whipped topping in right before you add in the cherries, chocolate, and amaretto. This is my FAVORITE Ben and Jerry’s ice cream. Unfortunately we don’t have one where I live and this recipe looks like something I could actually do in my own kitchen! I can’t wait to give it a try!